I enjoyed meeting all the people. I haven’t spoken to so many people with such varied backgrounds since I went to college – and it was never this much fun. Of course performing at Carnegie Hall was a phenomenal experience, but it was all the people working in such close collaboration that made it an experience worth remembering. There was a camaraderie that’s difficult to describe. I learned that in every step of our journey, there, during, and back, people were kind to us everywhere. It didn’t matter what we asked for: directions, advice on where to eat, taking a photo of our group, where’s the nearest (fill in the blank), taking a selfie with us, or any other advice. Sometimes it was a member of the chorus, our own church group, the bus driver taking us to our hotel, the local hospital staff, or even a stranger on the street. People were just constantly supportive, helpful and kind. From Roxanne’s Facebook: We often accuse God of putting unpleasant unexpecteds in our lives. Dan and I are thanking God for this unexpected blessing. 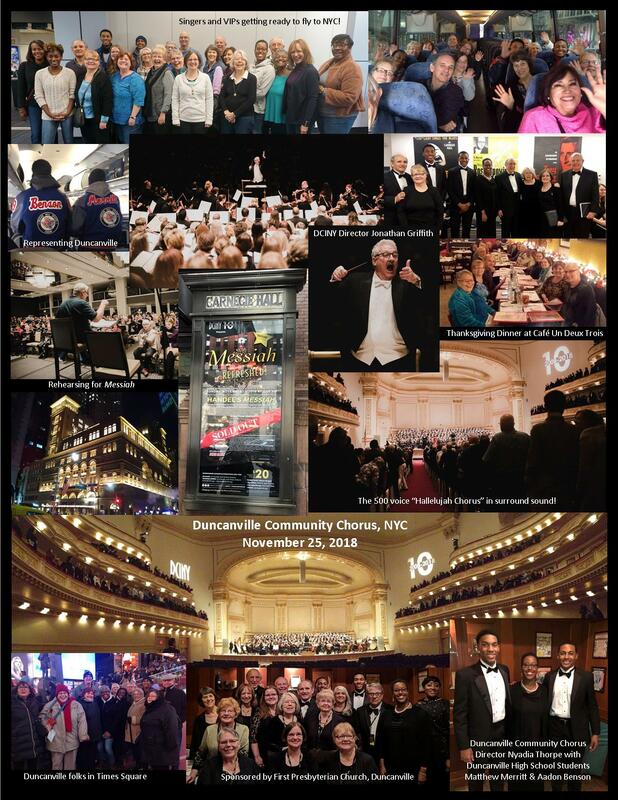 Together with The Duncanville Community Chorus and choirs from around the world we got to sing Messiah at Carnegie Hall! It was one of the most amazing experiences of our lives! The Carnegie Hall trip was one of the highlights of my life so far. I absolutely loved it! The moment we sang the first couple of measures, the tears just came. The sound was heavenly. Getting to sing with a chorus and orchestra of that magnitude was way beyond any experience I ever expected to have. Just to be surrounded by the beautiful voices and music and to be singing the scriptures was so powerful. Music speaks to me in a very powerful way. Singing The Messiah with the expert direction of Dr. Johnathon Griffith gave new and deeper meaning to the scriptures. The meaning of the words is deeply implanted in my heart differently than before. I had been taught most of the things Mr. Griffith taught us, but he has a way of helping one to remember and feel the words and music while singing. I learned again how important it is to enunciate the consonants and to hold my mouth in an oval shape. I also practiced how to breathe silently before singing and to breathe from the belly, not the diaphragm. I learned about when turning a page is allowed and what to do if I forget to turn it in time and about how to hold the music and when to lower it and raise it again so as not to distract from the ongoing concert. Many technical things that help to improve any performance. I felt confident and ready by the time for the concert. Mr. Griffith is certainly a master director, and I feel so very privileged to have spent rehearsal and performance time with him. What I enjoyed most was singing the beautiful music surrounded by the chorus of 500+. I enjoyed the whole trip – meeting new friends, having adventures and sightseeing with friends, rooming with Nancy, and experiencing NYC. I really enjoyed the cream cheese bagels, but I enjoyed the music the most. Also a note to Ginger from Diane: I’m still searching for the words to thank you for the wonderful experience of singing “The Messiah” in Carnegie Hall. It meant more than words can express, and I will never forget it. I know we would never have accomplished the trip if not for you and your love for all of us at FPCD and your faith in us to bring God’s Word to NYC through music. Musically I learned a lot, the actual music, in particular. I am not a classically trained musician, and I had never sung most of Parts 2 and 3 of the Messiah. Also, during the NYC rehearsals I learned how to breathe silently–who knew?? not me! I’ve said it before and will repeat: I was probably the worst singer there (that’s a fact, not being overly modest), but counted it a privilege to participate. Spiritually–it is blessing to have the scripture verses playing over and over again in my mind, providing opportunity to reflect on scriptures I may not always thing of. I enjoyed lots about the trip: learned great music; fun traveling with friends; happy to see my daughter check something off her bucket list (singing at Carnegie); happy to check something off my bucket list (birding in Central park); happy to spend time with my son, daughter-in-law, and granddaughter; happy for the fun photo memories. But most of all, I just can’t explain how wonderful it was to sing Worthy Is the Lamb with full orchestra and 499 of my closest friends in an amazing venue–it was an incredible experience! I learned that to produce an excellent program, much work is required. The dedication of the Duncanville singers was inspirational and impressive. They were all so committed. When the Messiah was sung on that Sunday afternoon, I felt that we were in the Heavenly realms, even though we were still on earth. To me, the Lord revealed a portion of his glory in that production. What I enjoyed about the trip was the ability to truly enjoy my visit to NYC. I have been to NYC many times in the past, but always either working or following someone else’s agenda. Even though we were there for the Messiah, I still had plenty of time to fully enjoy the experience of NYC for myself. It was a wonderful trip. In the past several years our church choir has put on large events and invited singers from the community to join in, creating a Duncanville Community Chorus. This past December 17, we did a performance of Handel’s Messiah: Part 1, which you can see in the video above. DCINY, the Distinguished Concerts International New York saw this video and used it as an audition. They invited our choir to perform at Carnegie Hall in New York City on November 25, 2018 as part of a group of distinguished singers and musicians. We invited talented singers from the Duncanville area to join our chorus and brought 18 singers and 8 VIPs to Carnegie Hall. Several singers also had family members and friends who came to watch the performance. To help our singers afford this trip, we did a lot of fundraising, which significantly lessened their financial burden. Thank You to all who made this trip possible!